Mobile Persuasion: Can mobile phones and cutting-edge behavioral science improve lives? Actually, the world doesn’t need to spend one more dollar on agricultural research. The truth is we have all the information we need to feed the world. What we don’t know is how to get people to use the agricultural products we already have. We might not fully agree, but it has a key insight. All of us- including people living in poverty- have complicated, demanding lives. So simple availability doesn’t mean that even life-changing services like vaccines and HIV tests stay at the top of our minds. Farmers tell us they want to use fertilizer, but it’s a hassle because the dealer is 35 kilometers away and by the time planting season comes they have no cash. People living with TB know they need to take their medicine. And they do, but as soon as they start to feel better- even though their treatment isn’t complete- many stop. Jerome has multidrug-resistant TB, he has been undergoing treatment for over a month at the East Avenue Medical Center, Philippines. We know this gap between our intentions and actions exists because we live it out ourselves. Who doesn’t have a medical appointment they’ve been avoiding or an antibiotic regimen they gave up the moment they felt better? In the developed world, we design programs like automatic retirement enrollment to make decisions as easy as possible. Yet, in development we often fail to design programs with simple human behavior in mind. A growing body of evidence demonstrates that leveraging behavioral science can significantly improve our impact. Slight changes in the way we offer services can matter. A study in India showed that offering women an appointment with a family planning counselor while not in the presence of their male partner significantly increased use of family planning services. At the same time as these advances, the mobile phone is revolutionizing our ability to communicate. With more than 500 million phones in Sub-Saharan Africa alone, there is a tremendous opportunity to combine behavioral science with the power of the mobile phone, or mobile persuasion. Using mobiles to change behavior increases our reach, our knowledge, and makes services more accessible. We can remind people in rural areas to take their medicine, digitally track performance, and make follow-up information as easy as receiving a text. 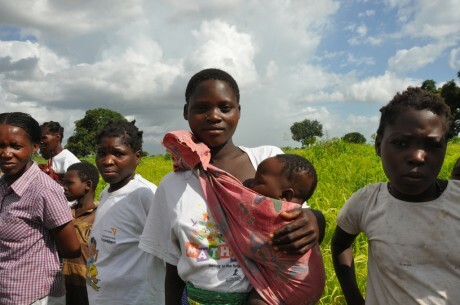 In Mozambique, USAID is testing and applying mobile persuasion with a few key studies. Helping Farmers Save: Poor farmers have a shock of cash after harvest but very little at planting season, the critical time to buy inputs like fertilizer. We’re supporting a study on offering farmers the chance to save for fertilizer right after harvest with mobile money. The ultimate goal is to increase farmers’ crops and income. To do that, the study will answer critical first order questions: can we increase farmers’ use of mobile money (a new and under-used technology in Mozambique)? Would small incentives encourage farmers to save and keep those savings until planting season? Would offering their friends and families the chance to save via mobile money increase use of mobile money by introducing a new social norm? Would that use translate into decreased demands on farmers’ savings? Helping People With HIV/TB: Sometimes we learn from good work that’s already on the ground. Absolute Return for Kids (ARK) and Universidade Eduardo Mondlane in Mozambique ran an SMS study that reminded people living with HIV to come to appointments and take their medicine. In 12 months, this increased appointment adherence for new patients in urban areas by 10 percentage-points. USAID is supporting the continuation of these messages and sending messages with innovative personalization to a new group of patients, those co-infected with TB+HIV. We’re excited to learn what works and what doesn’t. We’ll have results on the farmer study next month and will post the second part to this blog. Our challenge is to take these insights and apply them to other thorny development challenges. And, of course, to turn them inward to help USAID create the systems that make applying good science and user-centered design quick, easy, and transformative. To learn more about Mobile Solutions at USAID check out our website, follow us on Twitter, and sign up for our monthly newsletter. Learn about USAID’s new Global Development Lab and how we harness the power of mobile technology to help end extreme poverty. Check out how mobile money is shaping transactions in Malawi, how mobile phones are changing lives in In Afghanistan, and how new mobile clinics are taking health care on the road in Lesotho. 25 years ago said to me we don’t need more research to increase yield at cuban farms, today I think the same in Venezuela. In developing world we do need more reaseach in “human behavior” to know why the scientifc knowledge and agronomy technologies has not empowered small and low income farmers. Maybe, all the research was made with that farmers not in mind.